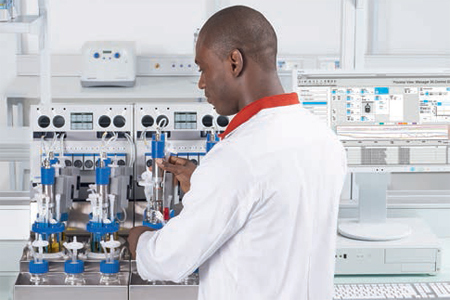 Optimization of bioprocesses needs accurate monitoring and control while small working volumes are saving media and other resources. Evonik® has established a 2 L process for production of a nutritionally relevant amino acid in E. coli. The following application note describes how this process was adapted to the smaller working volume of an Eppendorf DASbox Mini Bioreactor System. Multiple runs were performed with close monitoring of all relevant process parameters and comprehensive evaluation of data to prove reliable and reproducible results. The scale-down capabilities of the DASbox system were evaluated by comparing the fermentation results to the data collected at 2 L scale.